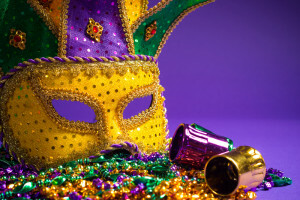 Saturday 1/26/19 Mardi Gras means Lanta gras! Our second ever appearance into this event which was sooooo much fun. Bring your happy hearts and dancing shoes cause Kirkwood will be lit! Note that you can do both gigs just need to be diligent. Instructions below including big instrument instructions. Muster: 1:30pm. Location Hallman st., near Howard intersection, Grateful Gluttons will be right behind us — look for the Puddles giant. we’ve had luck on Hallman St. west of Howard. To get there from Hosea Williams, turn left before you get to the post office onto Warren or Saunders St. and go in one block, then turn right and look for parking. Parking: Park west of Howard St. The streets will be closed between Howard and Howard starting at 11AM. I’d probably uber or something.. definitely carpool. Marta details below. BIG INSTRUMENTS ONLY, you should have received e-mail from me with parking information. Marta: The muster spot is about 1.1 miles from East Lake Marta station on foot. Buses: 21 (from King Memorial) leaves you .6 miles away at the Eleanor St Stop, 24 (from Edgewood-Candler Park station) takes you .3 miles away at the Hosea@Howard St stop. If you are coming from Juggler’s you are unlikely to make it on time via Marta, please carpool. Lanta Gras is a now a Mardi Gras celebration in our city. They do it as a fundraiser for schools and kids to learn and practice music. We’ll be performing among other great like-minded bands in Atlanta. It’ll be a parade, a standstill.. and who knows.. maybe even a jam! Come one come all! Huge block party at the end, anything Orpheus you buy goes straight into the bucket of cash to help kids, Pullman and the Kirkyard Pub donate 15% of the money they make Saturday to the cause. Oh, pack Bumper to Bumper and Ya move ya lose.. with 4+ bands at the event I bet we’ll jam.